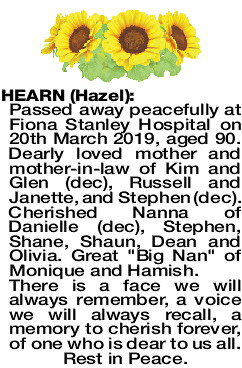 Passed away peacefully at Fiona Stanley Hospital on 20th March 2019, aged 90. Dearly loved mother and mother-in-law of Kim and Glen (dec), Russell and Janette, and Stephen (dec). Cherished Nanna of Danielle (dec), Stephen, Shane, Shaun, Dean and Olivia. Great "Big Nan" of Monique and Hamish. 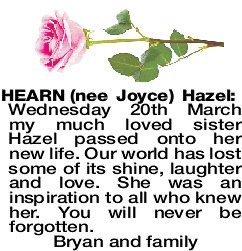 The Funeral Service for Mrs Hazel Hearn of Palmyra, will take place in our Chapel, 312 South St, Hilton commencing at 2.00pm on MONDAY (1.4.2019). Cremation will take place privately at a later time. 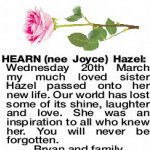 Wednesday 20th March my much loved sister Hazel passed onto her new life. Our world has lost some of its shine, laughter and love. She was an inspiration to all who knew her. You will never be forgotten.